Understanding how divorce and separation affects toddlers is critical to their emotional, physical and mental well-being. Toddlers may find divorce particularly confusing and stressful. They typically don’t understand what is going on and, in addition, have limited ability to express their thoughts and feelings. They understand that one parent is not living in the home, and that schedules are changing, but they do not grasp the reason(s) or concepts that are associated with the family separation. 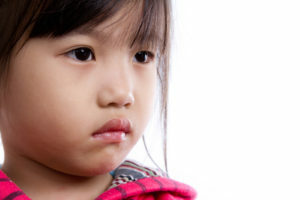 When adults decide to separate, a toddler’s may begin to display signs that their feelings are going through some changes. They may show signs that they are unhappy or upset about the family changes by becoming irritable, anxious, and fearful or becoming quieter and withdrawn. They may also start acting like younger children such as returning to the habit of sucking their thumb. Frequent shifts in emotional state are common. One minute they are comfortable and easy-going, and a few minutes later they become cranky and distressed. They may be angry about a parent’s absence or sad about not having two parents tuck them in at night. Since it is hard for toddlers to express their troubled feelings into words, their negative behavior and acting out may increase during the divorce process. It is difficult for toddlers to cope with strong feelings like sadness or anger. They may cry constantly or have frequent tantrums, lose their appetite or become picky eaters. These youngsters may experience changes in toilet habits and return to bed wetting. Some children may encounter sleeplessness, have nightmares, awaken suddenly, or become more fearful of the dark or sleeping on their own. Other signs may include physical symptoms such as stomachaches and headaches. These behaviors usually go away in time. While separation anxiety is a normal part of your child’s development at this age, it may increase significantly during this traumatic family transition. Some toddlers may become very upset by separation from a parent and refuse contact with other adults. They may also start staying close to adults rather than playing outside with other children. Similarly, children may cling to favorite stuffed animals and blankets as a way of managing the distress accompanying their changing family structure. In addition, young children may show signs of stress when they make frequent transitions between homes. Most young children need a lot of reassurance before and after transitions. Toddlers do not understand time. Therefore, toddlers may ask the same question over and over because they really do not understand what is going on even after you explain it. For example a toddler may ask, When is Mommy coming? and the parent may reply You will see Mommy on Wednesday. The child may ask the same question a few hours later, because he doesn’t understand how long it is until Wednesday. Since toddlers think about things in relation to themselves, they become concerned about how their needs will be met during the divorce. Toddlers may worry about who will make their dinner or tuck them in bed, and whether the parent they live with is also going to leave. A toddler wants to know that a parent, though not living in the home, still loves them and will always be part of their life. When adults decide to dissolve their marriage, it is especially stressful and confusing for toddlers. With limited coping resources of their own, they will need additional reassurances from both parents and other adults they interact with. They too are affected by changes in their family structure and changes in contact with each parent. Though toddlers may not appear to do so initially, over time most children adjust well to their parents divorce.